Shabbychick Junk. : Crankin 'em out! Ok guys, I'm in crank-em-out mode again. Grammie needs birthday cards & I'm low on thank-you cards, so I'm back into cranking out simple, no-fuss cards and using up paper! These pretty fall papers are from an 8 x 8 Daisy D's paper pad (Beacon Hill) that was gifted to me by friends at a retreat a few years ago. I'm on a mission to use it up! 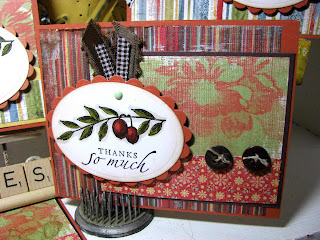 Daisy D's is one of my FAVORITE shabby paper lines. 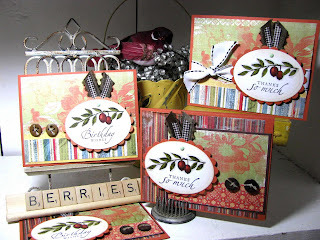 The berry and leaves stamp is an oldie but goodie, from Stampin Up's "Touch of Nature" stamp set. There are certain sets I will always gravitate back to and this is one of them. I've got more cards coming up soon using the bird & branch from this set too. I have SO much to show you guys so stay tuned! If you want to play along, use my layouts and start cranking out the cards with me! I've recently been making 6 at a time...why not stamp 6, it's just as easy and you've got the inks out already! Or get REALLY crazy and crank out 10! Come on girls, USE IT UP! Can I get a what! what! These are super cute. Love crankin' them out. I do the same thing. 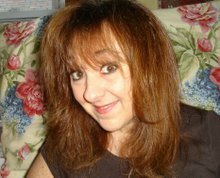 Hugs girlie! Your precious little set design is A+dorable, and your cards are really special! hey stranger! What are you using for the layering of the ovals? or did i just read over that detail? as always I love your cards! Good a.m. I think thhe dogs are adorable! You have done a great job in using them! !